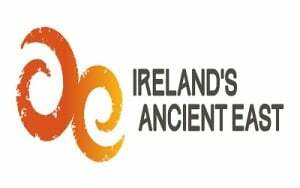 Ireland’s Ancient East is a wonderful opportunity to experience 5000 years of history in just one week! Heritage Island Discount Card – Discount Pass & access to over 70 of Ireland’s Premier Attractions such as the House of Waterford, Titanic’s Dock, Bunratty Castle & much more! Immerse yourself in a journey of discovery, see, hear, touch and feel the imprints of the settlers in this land. Discover tombs older than the Pyramids from pagan and Celtic Ireland. Step into Ireland’s Golden Age of Saints and Scholars and visit the university and monastery sites where Ireland’s pioneering saints and monks wrote some of the world’s greatest illuminated manuscripts. Explore the pathways and lush river valleys of Medieval Ireland to hear tales of invasions and rebellion, and let your imagination take flight amongst the walls of Ireland’s greatest castles and fortresses, where foreign knights wrested the land from the old chieftains. Discover the stories of a time of contrasts which shaped the lives of the now settled conquerors of Ireland and those they ruled over. This is the time of Empire, Rebellion, Innovation and Industry. You will leave not only refreshed but illuminated by these many ancient wonders and the stories of how they came to this rich land and how Irish life today has been shaped by their immensely powerful influence. Depart Dublin and travel south to Powerscourt House & Gardens in County Wicklow. Visit the highest Waterfall in Ireland, explore Ireland’s most magnificent gardens and visit Powerscourt House and learn of its 800 year history. Continue to historic Wicklow Gaol and learn of the Gaol’s 200 year history through the eyes of the inmates. Travel south to Wexford where you can visit Hook Lighthouse, The oldest intact operational lighthouse in the world. Check into Dunbrody House for overnight, one of Ireland’s leading luxury County hotels. .
After a full Irish Breakfast at Dunbrody House visit Waterford City, Ireland’s oldest city. Visit Waterford Treasures – Three Museums, that tell the 1100 year old story of Waterford from its foundation in 914 by Viking sea pirates. The House of Crystal features the largest collection of the world’s most coveted name in crystal….In the afternoon visit Cahir Castle, once the stronghold of the powerful Butler family, the castle retains its impressive keep, tower and much of its original defensive structure. It is one of Ireland’s largest and best preserved castles. Overnight again at Dunbrody House. 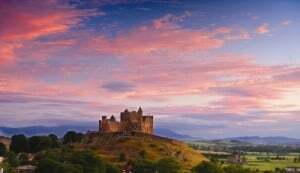 Depart Waterford and travel to the Rock of Cashel in County Tipperary which stands on a rocky outpost surveying the land which surrounds. Powers be they royal or religious, ruled here for 1,200. It is where ST Patrick is said to have baptized Aengus, King of Munster. Just outside Thurles is Holycross Abbey, founded in 1168 for the Benedictines by the King of Munster Donal O Brien. Your finakl destination today is Kilkenny. Visit the magnificent Kilkenny Castle which overlooks the River Nore and has guarded this important river crossing for more than 900 years. Across from the Castle is the Kilkenny Design Center where you can see local craftspeople at work. Overnight at Kilkenny Ormonde Hotel. Enjoy your morning at leisure in Kilkenny. There are only 2 round towers in the country that you can climb and one is at St Canice’’s cathedral. Take in the view of this compact city and having looked inside the cathedral, walk up the medieval mile passing the sights of the Smithwicks Experience & Rothe House. Rothe House is a unique Irish merchant’s townhouse, built between 1594 and 1610. The property is now owned by the Kilkenny Archaeological Society, and is home to their large collection of artefacts relating to Kilkenny city and county. In the afternoon travel to Clonmacnoise. This moastic settlement is where pagan met with Christian Ireland, its high crosses depicting stories of both. Your final destination today is Trim Castle Hotel in County Meath. Enjoy a full day tour in County Meath. The county’s lush plans are replete with ancient Celtic monuments, castles and churches. Known as the Royal County, Meath’s colors are green and gold-green for its rich grass pastures, gold for the High Kings of Ireland, who reigned there for centuries. Trim Castle built in 1173 is the largest Anglo Norman Castle in Ireland. For many, the sacred Hill of Tara embodies the very soul of Ireland – according to myth, otherworldly peoples like the Formorians and De Danaan struggled here for temporal and mystical power. Newgrange can be counted among the wonders of ancient Ireland. 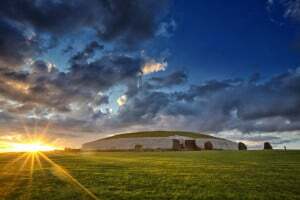 It is a large mound that contains a passage tomb in which Stone Age Man buried the cremated remains of their dead around 3,000 B.C., which predates the Egyptians Pyramids. St Colmcille established a religious settlement in Kells in 806AD. It is here they completed their illuminated manuscript, the Book of Kells….Overnight again at Trim Castle Hotel. Interested in Ireland’s Ancient East Chauffeur Tour?